a year out: graduation, unemployment, volunteering, employment… and health insurance! strung along with a bunch of interviews for maternity leave positions, state public health coordination jobs, etc. hired! quickly move out of state. and here i am, months later, all employed and stuff, being all independent and autonomous. 🙂 take that, job application process – 6 months of unemployment living at home ain’t got nothin’ on me. Yesterday was National DNA Day. In addition, 23andMe decided to hold a massive sale on their “complete” scan for $99. That in and of itself is not so exciting to me. What is, however, is the ensuing commentary that I found on SlickDeals. It is rare you see such a massive discussion with hundreds of contributors from the general public commenting about the risks/benefits/limitations of 23andMe in such a public forum. Of course there’s the general trolling “I got my results back last week, I’m half German shepherd! Thanks, 23andme!”, and the people who are just excited by the price “OMG! This is a really hot hot deal!”. Go take a look, mine through the pages. This would contribute amazingly to someone interested in looking at public perceptions of DTC, in a format that is free from study bias. Gizmodo has some interesting commentary too! The framing of numerical risk comparisons as incremental values when compared to showing risk figures as simply a comparison of absolutes risks has been show to better focus the target audience’s attention on specifically the change from baseline risk (Zikmund-Fisher B, Fagerlin A, Roberts A, Derry H, et al 2008). In the context of genetic risk communication and genetic counseling for many highly-penetrant and/or mendelian-inherited disorders, the risk of developing symptoms and risk of inheritance, respectively, garner considerably less utility in highlighting incremental risks given the often extreme differences that exist in these risks when compared to the general population. In stark contrast are those risks conferred to individuals when common genetic variants, such as those ascertained through many recent genome-wide association studies imparting minimal to modest risks, many with a relative risk under 2 (Eng C and Sharp R, 2010). Among a slew of complex ethical, legal, and social issues surrounding the reliability and clinical utility of communicating these common variant risk modifications to the public, an underlying methodological issue has been how a genetic counselor can actually communicate such small relative risk figures without misrepresenting the actual changes in baseline risks and increase in risk due to a variant. A potential solution lies in the communication of incremental risks in the methods that the authors of Zikmund-Fisher et al. 2008 demonstrate, focusing on comparison of baseline, absolute risks and the incremental changes attributed to presence of a common genetic variant. In order to properly frame the utility of incremental risk in this scenario, a hypothetical discussion of an individual with a baseline heart disease risk of 14%, and a testable, validated common genetic variant will exist, with an relative risk of 1.3 affecting heart disease in individuals of this population, will be presented. One technique normally found in the genetic counselor’s repertoire in risk communication has been to state baseline risks, and then to provide the odds ratio of possessing the common variant in multiple formats. These multiple relative risk formats could be framed as “1.3 times greater chance of heart disease”, shown that the variant provides “30% more risk”, or provided as the absolute risk of an individual with the common variant to be 18.2% for heart disease. None of these techniques, however, highlight the “marginal increment in risk while simultaneously providing information about baseline risk level for context” (Zikmund-Fisher et al. 2008). Instead, framing the change in risk of an individual that possesses our proposed common variant through incremental risk, may highlight the change in risk more accurately without the need for more high numeracy-requiring processes of mental math: multiplying relative risks against baseline or subtracting absolute final risks from baseline. In this scenario of highlighting incremental risk, the communicated risks would thus be provided as a baseline, absolute risk for heart disease of 14%, while individuals possessing the common variant experience an incremental absolute increase of 4.2% risk for heart disease, providing a total of 18.2% absolute risk. While the authors of Zikmund-Fisher et al. 2008 acknowledge that providing incremental risk altered the degree of worry in participants, without knowing what the appropriate degree of worry should be among these individuals, the focus on the specific change in absolute risk more accurately distinguishes for audiences the most important element of the risk communication. Eng C, Sharp RR. Bioethical and Clinical Dilemmas of Direct-to-Consumer Personal Genomic Testing: The Problem of Misattributed Equivalence. Sci Transl. Med. 2010: 2, 17cm5 . Zikmund-Fisher BJ, Fagerlin A, Roberts TR, Derry HA, Ubel PA. Alternate methods of framing information about medication side effects: Incremental risk versus total risk of occurrence. Journal of Health Communication 2008;13(2):107-24.
so sometime in the recent past while taking a family history, my patient reported that her husband’s mother had a hysterectomy as a result of uterine prolapse. the husband then covered his ears and didn’t want to hear it, and reported that he didn’t know of this history, mostly jokingly. medical histories and family histories are so revealing and often graphic to other family members in the room. I try and gauge what people say that makes others uncomfortable, but on the other hand, i tend to be a very matter-of-fact, this is what it is, it’s your family history take on it too. especially since we assume consent of the information if the patient brought that person into the room. but it’s especially complicated because these are medical history information facts that my patient’s husband’s mother provided to my patient, and the husband perhaps slightly more oblivious to the details, didn’t want to hear. it’s just another gross female thing guys don’t want to hear about, right? well, the damage is done i guess. As I’ve mentioned multiple times, voices from males in the genetic counseling field are few and far between. The following study from the Minnesota training program perhaps sheds a little light on the issue, although know the caveat that the conclusions and comments stem from only a sample of 3 male students. Since the males had spent most of their lives in the majority vis-a-vis their gender, their more recent minority status as graduate students might be more distressing than for the female student participants who have a history of being in the minority because of their ethnicity. In the present study, male participants appeared to be most adversely affected by their peer relationships. One male participant stated: “[my classmates] don’t even attempt to allow me to be a part of the group, but rather assume that we are so different it is not worth it.” It is unclear if a similar disparity exists among practicing genetic counselors, as all of the male participants in this study were students. Some participants sought out organizations or environments where they were guaranteed to interact with others from a similar ethnic/cultural group, especially the males, who expressed a need to do masculine things. It definitely provides an interesting view of the experience of males, individuals of underrepresented racial/ethnic groups, and the potentially expanded implications on men who are of an underrepresented racial/ethnic group. So.. “statistically significant” differences between many genetic-medical issues, but.. wait, no difference between socio-medical issues? Wait, let’s look at those numbers.. they’re all really low anyway so how useful is that information? 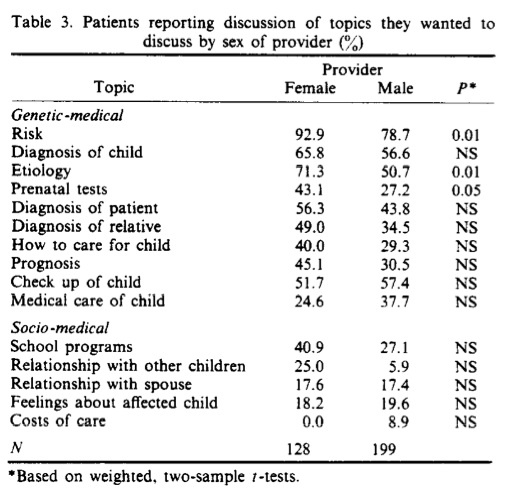 What’s interesting about the above data is “relationship with other children” under soci-medical. a difference of 25 to 5.9 isn’t statistically different? Again, low numbers.. I suppose? 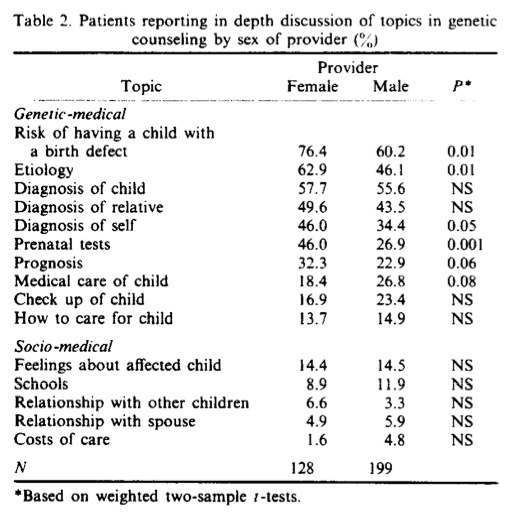 What I’d be most worried about are the more counseling-aspects especially “raising a child with a birth defect”, “helped with most personal concerns” … but instead those were not statistically significant. What the authors claim was statistically significant (with a p-value of 0.06? no, that isn’t..) is “failed to ask about all concerns” with males faring worse. Available data suggest that women patients seen by male providers. in genetic counseling at least, are likely to receive neither as exhaustive a discussion of selected basic medical and genetic topics, nor as much discussion of the specific topics they came to counseling to discuss. as do women patients seen by female patients. Frankly, that’s a bit ridiculous based off of this data. Really? Gonna make those arguments based on a comparison of 8.6% to 17.6%. Oh, right, they’re MDs and not genetic counselors. And.. the study is 25 years old.